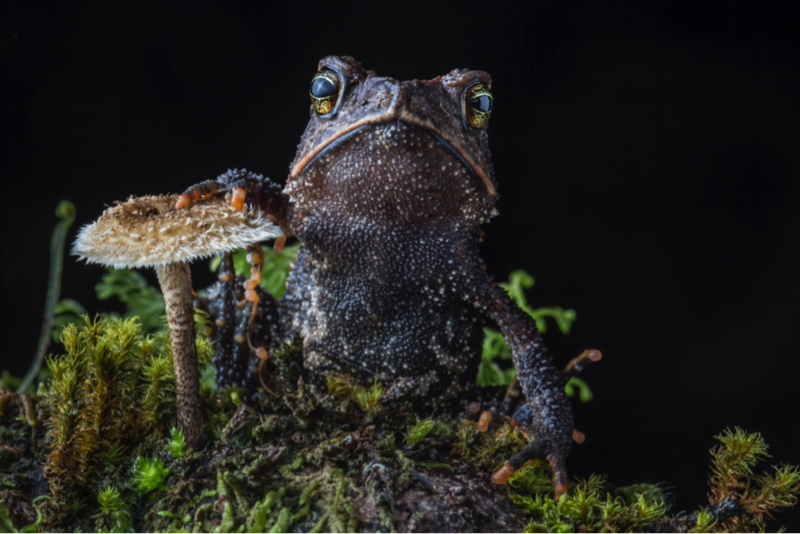 Creation of a reserve to protect globally threatened amphibians in a critical area of humid subtropical forest in Guatemala. The Sierra de los Cuchumatanes, a mountain range covered in lush subtropical forest, is a centre of amphibian endemism, harbouring unique species of salamanders, frogs and toads. It has been identified as an amphibian Alliance for Zero Extinction (AZE) site and an Important Bird Area, supporting three globally threatened bird species. While its remoteness has protected a portion of the forest to date, there are increasing pressures to exploit the land for coffee production. 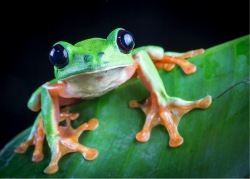 In early 2015, an opportunity arose to purchase a strategic 845-ha (2088-acre) property, Finca San Isidro, that harbours eleven threatened amphibians and was slated to be cleared for coffee production within a year. The Critically Endangered Black-eyed Leaf Frog, Agalychnis moreletii, occurs at the San Isidro reserve. The property was purchased with support from ICFC, World Land Trust, Global Wildlife Conservation/Amphibian Survival Alliance and Rainforest Trust, creating the "Yal Unin Yul Witz" reserve. 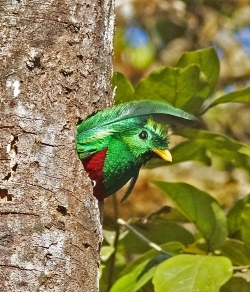 The new reserve will be owned and managed by the Guatemalan organization FUNDAECO. Our partners in this acquisition are: Fundación para el Ecodesarrollo y la Conservación (FUNDAECO), the Guatemalan NGO that will own, manage and protect the reserve; and UK-based World Land Trust (WLT), Global Wildlife Conservation/Amphibian Survival Alliance, and Rainforest Trust. 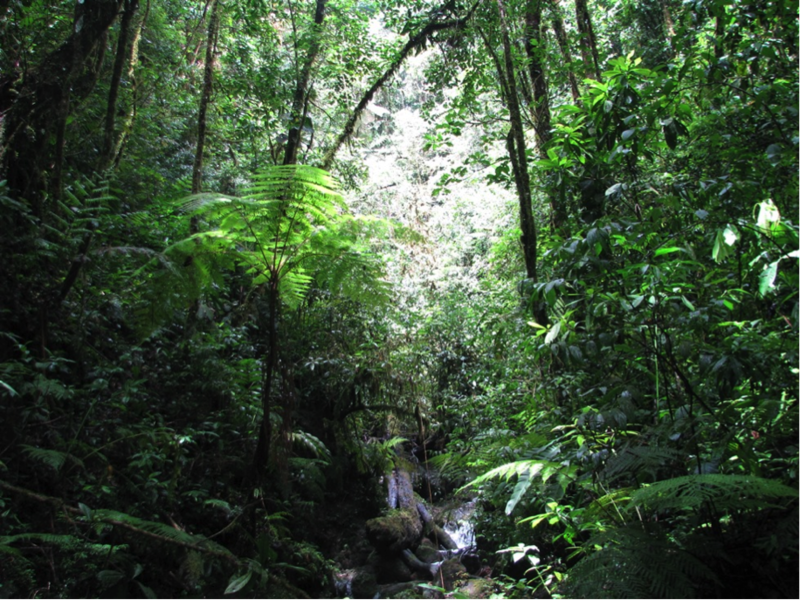 FUNDAECO is a current ICFC partner for the Sierra Caral Reserve, Laguna Grande reserve and Tapon Creek Reserve. This site was identified as an international conservation priority. Why? The answer involves a group called the Alliance for Zero Extinction (AZE), whose goal is to prevent species extinctions by identifying and safeguarding the places where species assessed as Critically Endangered (CR) or Endangered (EN) using the IUCN Red List methodology are restricted to single remaining sites. FUNDAECO has adopted the AZE sites identified for endemic and CR amphibians as a tool to prevent the most predictable species losses. In 2009, with support from the Critical Ecosystem Partnership Fund, FUNDAECO carried out a survey of all Amphibian AZE sites in Guatemala. The survey confirmed the presence of endemic and highly threatened amphibians, sometimes surviving in very small areas, at various sites. This includes AZE site GTM5 known as Montaña Los Angeles-Soloma-Todos Santos, Cuchumatanes, in northwestern Guatemala, where Finca San Isidro is found. In the mid-1970s, northwestern Guatemala was highlighted by eminent University of California, Berkeley amphibian biologist Dr. David Wake as a priority for amphibian exploration. Subsequently, two students, Paul Elias and Jeremy Jackson, discovered there three new species (Finca Chiblac Salamander, Bradytriton silus, Long-limbed Salamander, Nyctanolis pernix and Jackson's Climbing Salamander, Bolitoglossa jacksoni) and two completely new genera that represented evolutionary missing links in the Neotropical plethodontid (lungless salamander) diversification. Following these discoveries, the three salamander species went unrecorded for over three decades until, at the turn of the century, Bradytriton silus and Nyctanolis pernix were rediscovered during several expeditions to the Cuchumatanes mountains. The most recent expedition, in July 2014 in the course of the FUNDAECO Amphibian AZE expeditions, confirmed their presence in the subtropical forests of the Huehuetenango region. There are in addition another nine globally threatened amphibian species confirmed for Finca San Isidro, including seven CR, three EN and one Vulnerable (VU) species (see table below). This total of eleven globally threatened amphibians comprises nearly 14% of the 80 threatened species reported for Guatemala. Table 1. List of amphibian species found within the boundaries of the San Isidro property, with IUCN Red List designation. Species in bold are considered to be threatened as per the IUCN Red List of Threatened Species. Source: Carlos Vásquez, pers. comm. 2015. San Isidro is found within one of Guatemala's conservation gaps: there has not been a single protected area in the Department of Huehuetenango, and only two municipal reserves have been created (also with the support of FUNDAECO). Over 60% of the montane tropical forests of northern Huehuetenango have been lost in the last thirty years. Population growth and subsistence agriculture have been the main drivers of deforestation in the region, although forest loss due to firewood extraction is also an important threat, especially for amphibians. The previous owners of the 845-ha San Isidro property were coffee growers, and a few had plans to move into the property and clear the forest if the purchase of the reserve did not take place. Considering the threatened amphibian species richness of San Isidro, the acquisition of the property was an urgent priority. ICFC funds, together with those of other organizations in this land purchase, have been used to purchase the property to create the "Yal Unin Yul Witz" Reserva Natural Protegida (protected nature reserve). The name derives from the local language Q'anjob'al and means sleeping child between mountains, with "sleeping child" the local name for salamanders. The reserve will be owned and managed by FUNDAECO. The reserve is in the process of being registered in the Guatemalan System of Protected Areas (SIGAP) as a Nature Private Reserve. A reserve manager has been hired. A cabin is being constructed as a base for administration, biological monitoring, and surveillance activities. Biological surveys of the reserve were conducted for birds, amphibians and reptiles. A forest management plan is being formulated for submission to the Guatemalan Forestry Incentives Programs Initiative (PINFOR). PINFOR promotes sustainable forest management and makes direct "forestry investment certificate" payments to participating landowners. In the works is a feasibility study for the establishment of a model ecological coffee plantation (shade-grown, organic) in the reserve. A visit from staff of Anacafé (Guatemala's coffee association) will assist this process. The plantation would provide local communities with income from the reserve, demonstrate best ecological practices, and provide a 'blueprint' that can be shared with coffee co-operatives throughout Guatemala and beyond. FUNDAECO excels at community outreach and education, and its plans Include a public inaugural ceremony for the reserve April 14th, 2016; a meeting with the Water General Committee representing the seven communities to share the vision and objectives for the new reserve; and meetings with community representatives to evaluate possibilities to expand the reserve through further land acquisition. All contracts for the acquisition of the property stipulate that the land has been acquired exclusively for conservation purposes. All contracts are registered with the national land registry. Registration of the property as a Nature Reserve, so that it will be recognized as part of the National Protected Areas System (SIGAP). The inscription of a conservation easement (Anotación Registral), which is a legally binding covenant stating that the property is dedicated exclusively to conservation purposes. The inscription of the property in the Forestry Incentives Program (PINFOR-PROBOSQUE), which supports the forest protection in a mid-term period (5-10 years). One hectare of the property will be registered in the name of the International Conservation Fund of Canada; simultaneously, mutually binding conservation easements are registered on the one-ha property and the remainder of the property. This will confer on ICFC the legal right to defend its conservation easement over the property in Guatemalan courts.